SRMJEEE 2019 will be held from April 15 to 25, 2019. Registered candidates can now do book their test date, slot, and venue. The slot booking for SRM Joint Entrance Examination for Engineering 2019 started on April 10, 2019. Right after booking the slot, candidates can download their admit card. SRMJEEE will be held at the national level, in 217 centres. Candidates who will qualify SRMJEEE 2019 will get admission in B.Tech courses offered by SRM Kattankulathur, SRM Ramapuram, SRM Vadapalani, SRM Gazhiabad, SRM Amaravati, and SRM Haryana campuses. 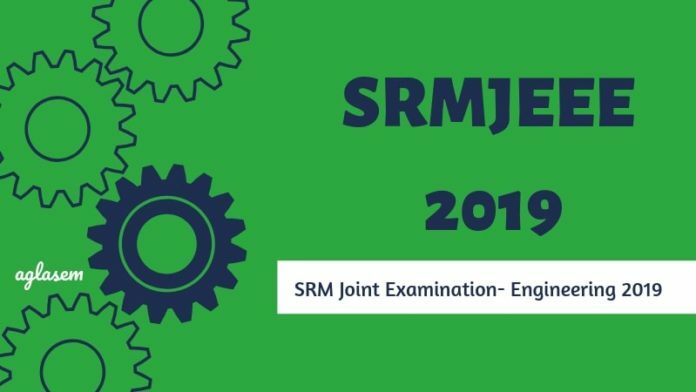 Know more details on SRMJEEE 2019 from this page. Latest: SRMJEEE 2019 slot booking has started, do the booking from the link below. The last date to register for SRMJEEE 2019 is April 20. Apply Now. The first center choice of the candidates is the default center option. However, if the number of candidates registered for that particular centers is less then candidates will get 2nd or 3rd choice of the center. To do the slot booking, candidates need to click on the link above and enter application number and password to login. 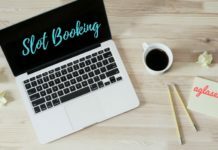 Slot booking, cannot be changed. Hence, it is advised that the candidates do the booking carefully. 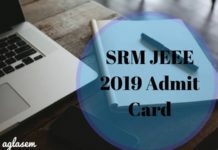 After the slot booking is done and the candidates can download SRMJEEE 2019 Admit Card. The admit card contains the final allotted exam date, time and venue. Also, it contains Name and Photograph of the candidates as uploaded in the application form. The admit card also contains the exam center instructions like when to reach the exam centers to be able to be on time for the examination. The hard copy of the admit card is only acceptable at the exam centers and not the soft copy. Therefore, take 2-3 printouts of the downloaded admit card. Once registered, the candidates get a verification e-mail, in which they need to click and verify. After this, candidates will be able to log in and fill details in the application form of SRMJEEE 2019. The details to be filled in the form are – test center preference, personal details, academic details, contact, details, etc. Other than the details, the candidates also need to upload images and pay the application fee. Rs. 1100 for candidates belonging to all the categories. The fee can be paid online, via Net Banking, Debit Card, Credit Card, Paytm, E-Wallets, and UPI. Non-Resident Indians (NRIs), holder of PIO or OCI card issued by the Government of India are also eligible. B). Age Limit: The candidates applying for SRMJEEE 2019 must be 16 years old, as on July 31, 2019. The maximum age limit is 21 years. Candidates should have qualified class 12th / equivalent, Physics, Chemistry, and Mathematics as the core subject. In class 12th / equivalent exam, the minimum aggregate score should be upto or above 50%, in PCM. Candidates applying for Bio-Technology must have Physics, Chemistry, and Mathematics / Biology / Bio-Technology as core subjects. Candidates appearing for class 12th exams in 2019 can also apply. Direct Admission: Board toppers and top 10000 rank holders in IIT-JEE (JEE Advanced), and top rank holders in every district of Tamil Nadu shall get direct admission in SRM University. Test Mode: Computer Based Test (CBT). Type of Question: Multiple Choice Question (MCQ). Subjects: Physics, Chemistry, Mathematics / Biology. Mode of Paper: English Only. Marking scheme: +3 marks for each correct answer and no negative marking for incorrect answer. Distribution of Question and Marks: As in the table below. – Click here to check the detailed topics covered SRMJEEE 2019. The result of the SRM entrance exam for B.Tech admission is notified via the registered email ids of the candidates. The result is made available on the official website srmuniv.ac.in. 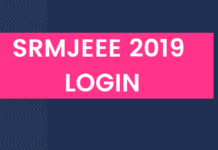 The candidates can log in using their SRMJEEE 2019 Login details to check their SRMJEEE 2019 scores. The result will have their ranks the examination too. As per the ranks, the merit list for admission in B.Tech courses is prepared. Close to 76,000 aspirants become eligible counselling out of the registered 2 lakh candidates for SRMJEEE. Now, depending upon the qualifying students, the number of counselling rounds are decided. As per the SRMJEEE ranks, the candidates are called for the counselling rounds. In the counselling rounds after the document verification process, the candidates are allotted seats and campus as per their choice of course. Note: On completing the counselling process and formalities, candidates get a Provisional Allotment Letter (PAL) to confirm their admission. Via SRMJEEE the candidates are able to take admission in the following engineering major and minor courses, across the 6 campuses of SRM University. 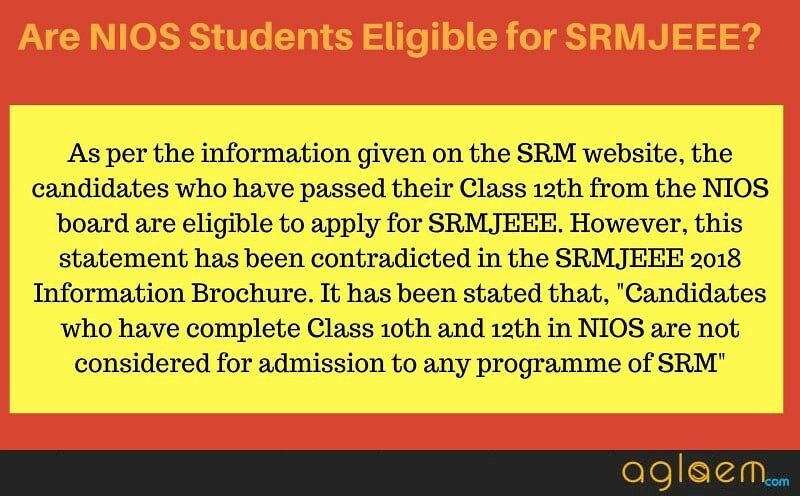 To know more about SRMJEEE 2019, download SRMJEEE 2019 information brochure. If you have any queries about the SRMJEEE 2019, then let us know in the comment section below.